Mickey's Not-So-Scary Halloween Party is a family-friendly event at the Magic Kingdom. Highlights include the "Boo To You Halloween Parade," during which Disney characters — including Mickey, Minnie, Donald, Pluto and Goofy — can be seen in their favorite Halloween costumes parading along with others down Main Street. The party also features "Happy HalloWishes" fireworks spectacular. And the most popular Magic Kingdom attractions, including Pirates of the Caribbean with Capt. Jack Sparrow and the park's Haunted Mansion, are open. Visitors are invited to come in costume and trick-or-treat at a variety of stations throughout the park during the event. Party hours are from 7 p.m. to midnight. Mickey's Not-So-Scary Halloween Party is featured on Sept. 14, 21, 28 and 30; Oct. 4, 5, 8, 11, 14, 16, 18, 21, 23, 25, 26, 28, 30 and 31; and Nov. 2. Tickets at the gate are $63.90 for adults, $54 for children ages 3 to 9. Visit www.disneyworld.com/halloween; or call 407-934-7639. Now in its 17th year, Halloween Horror Nights is where you can come face to face with Freddy Krueger, Jason and Leatherface. There are also chilling haunted houses that terrorize even the most intrepid guests; intense, skin-crawling, scare zones; scores of "scare actors" roaming around; and themed shows which are sure to chill and petrify. Halloween Horror Nights are presented on Sept. 28-29; Oct. 4-7, 11-14, 18-21, 24-28, 31; and Nov. 1-3. It is too intense for youngsters, and guests in costumes are not admitted. Single-night admission (valid all nights the event is presented) is $71 for adults and $60 for children ages 3 to 9. A Frequent Fear Pass offers 13 nights for the price of one ($64.95) valid on select nights: Sept. 28-29; Oct. 4, 7, 11, 14, 18, 21, 24, 25, 28, 31; and Nov. 1. Call 877-284-4679 or visit www.halloweenhorrornights.com. Halloween meets the sea with friendly sea witches, flamingos, mermaids, schools of pumpkin fish and other costumed characters haunting the park during Sea World's Halloween Spooktacular, an event suitable for the whole family. The event's theme is, appropriately, "FantaSea." If you like, dress in costume, as there are trick-or-treating treasure troves with treats galore throughout the park. SeaWorld's otters and sea lions present Halloween-themed shows. Sea World's Halloween Spooktacular is presented on Oct. 6-7, 13-14, 20-21, 26-28 and 31. It is included in park general admission ($64.95 for adults, $53.95 for children ages 3-9). Park hours are 9 a.m. to 7 p.m. Call 800-406-2244 or visit www.seaworld.com. Whichever park's festivities you choose to attend, you'll find the best selection of costumes at AnniesCostumes.com. Halloween from a psychologist's prospective. Sally Foster, a psychology professor with the University of Miracosta, Calif., and John Suler, psychology professor at the Rider University in New Jersey are two experts that say our costume choices are not random, even if we think so. And although you might think your mask hides you, it's not entirely true. Although price, comfort and convenience can factor in, when you choose a costume, you live a fantasy and you show the others a part of your inner self. Here's what Foster and Suler say about various costume types. French maids, hot nurses or prostitutes can represent one's own repressed sexuality, Foster said. They also can be healthy expressions of someone who is not very repressed. Suler said the increasingly popular "pimp and ho" characters represent inner struggles. "Should we be pure and chaste and holy ... or let loose with sexual desires and acting out? In those costumes you see these inner struggles (again, a polarity) being expressed." Costume choices rooted in fame and popular culture tend to follow trends, and like trends, they may spread quickly then disappear, Suler said. People may simply wish to display a knowledge of current events or share their interests. Or they may use them to express personality traits or social issues that are associated with the celebrity's image (sensuality, intelligence, power, corruption, rebellion, etc.). "I think this is a likely choice for the Walter Mittys of the world to be someone more dashing and daring, someone with real power," Foster said. Zombies, vampires, skeletons and other monsters show our fascination with the macabre, the grotesque. Death has always been something we humans are scared of, yet drawn to, Foster said. Fairies or princesses represent one's lost innocence or beauty, or a return to a safer and simpler time, Foster said. Generally, animals represent strength, basic instincts, with other specific traits for specific creatures, Foster said. For instance, cats are sensual, purring, soft creatures. "I saw two women dressed as cats even though in real life they're very reserved persons and do not display their sensuality," Foster said. Because animals symbolize certain traits or attributes in myth as well as popular culture (such as strength, loyalty, grace, independence, cunning, transcendence), an animal costume may represent some real aspect of a person's identity, or some admired characteristic, Suler said. Thinking in the tradition of the Native American, he added, we might even regard an animal costume as being an individual's totem -- a symbol of one's essential nature or potential. Clowns and the like represent whimsy, playfulness and youth, Foster said. People want to leave their serious natures behind on this holiday. Some cartoon characters have very cultural significance and may even represent archetypal personality types (for example Bugs Bunny as a confident trickster), according to Suler. And some adults wear more sophisticated cartoons, such as anime. The psychological tone of these costumes tend to be more seductive, whimsical or mysterious. Evil costumes allow people to safely -- and even creatively -- express their dark side without guilt, Suler said. He adds that some people may use evil or aggressive costumes as a way (consciously or unconsciously) to alienate others, which indicate anxiety about intimacy and being vulnerable. This can be a variation of the "evil" costume, or a more benign expression of a fantasy of omnipotence, Suler said. They also can express underlying feelings of helplessness and insecurity. So before you put on your costume, whether it's a monster, a "Matrix" hero, a witch, a priest or a prostitute, consider your choice -- it may tell people more about you than you realize. Cosplay (コスプレ, kosupure? ), a portmanteau of the English words "costume" and "roleplay", is a Japanese subculture centered on dressing as characters from manga, anime, tokusatsu, and video games, and, less commonly, Japanese live action television shows, fantasy movies, or Japanese pop music bands. However, in some circles, "cosplay" has been expanded to mean simply wearing a costume. The World Cosplay Summit 2007 took place earlier this month in Tokyo, Japan. Here are the winners of the Cosplay Championship, which is not only for costumes, but performance as well. The duo of Isabelle and Damian who performed as Tsugiri and Myoubi from ‘Alichino’.They were presented with a trophy from Judge Monkey Punch, a return trip ticket to Japan from Judge Ken Nagata, and the Minister for Foreign Affairs Prize (this prize is for those who promote friendship between Japan and other countries in the world) presented by Judge Hiroshi Tokita. The duo Naoki Shigure and Kikiwan, who performed as ‘Light Yagami’ and ‘Deathnote Misa Amane’ from ‘Deathnote’. They received an assortment of manga and anime goods worth 100,000 from Judge Ichiro Mizuki. The duo of Linaloe and Alejandra performed as ‘Eternal Sailor Moon’ and ‘Sailor Galaxia’ From ‘Pretty Guardian Sailor Moon’. They received a Brother super-slim digital ‘MyMio MFC-850CDN’ Multifunction Machine from Judge Essai Ushijima. To give you an idea of what its like, check out this video, I'm not sure if its a parade or just crowds of people walking. You will spot some really awesome costumes! So, for all you do-it-yourself costume makers out there, kudos to your creativity. You are awesome! In years past, Halloween in Lahaina, Hawaii, has meant a big celebration with a parade, costumes, and sometimes a wild affair attended by residents and tourists alike. The Halloween celebration in Lahaina has raised some concern as of late, with many expressing concern that the celebration gets too out of control for the small island town to handle. Not to mention the contoversy that has arised when several native Hawaiian groups have expressed their disapproval of many components of the event taking place on the same grounds that are rich with their heritage and traditions of the past. I have been following the story in the news the past few weeks and, as a Halloween enthusiast, I am happy to see that the StarBulletin.com is reporting that Halloween is ON in Lahaina! LAHAINA » Revelers will be out in force on Front Street again this Halloween after Maui County's Cultural Resource Commission voted in favor of allowing the Lahaina event to proceed as planned. Dissent from several native Hawaiian groups has done little to spook event organizers in the past, but ensuring that all goes well this year "puts a little bit of a fear of God into us," said Joan McKelvey, a member of the Lahaina Town Action Committee, the group tasked with organizing the event that draws an estimated 35,000 people annually. "We're hoping everything will go as it always does -- very well -- on Halloween night," said McKelvey. Criticism has grown in recent years that the celebration has become too wild, with some of the costumes unsuitable for young eyes. Nani Watanabe, who joined her fellow commissioners Aug. 2 in voting 5-1 in favor of running the event as planned this year, remarked, "By approving Halloween in Lahaina, we know it's going to be safe, controlled and organized." New Movies Announced at Comic-Con = Future New Costumes! I'm always on the lookout for what's next in the costume world. The Comic Con convention in San Diego earlier this month is defnitely a crystal ball into the future costumes of Halloween 2008 and beyond. I know, Halloween 2007 is still two months away, and here I am talking about 2008 already! » Marvel executives and "Iron Man" director Jon Favreau revealed plans to begin teaming heroes in future flicks (see "Comic-Con: 'Hulk' Smashes At Marvel Panel, Plus 'Iron Man' Cameos To Spawn 'Marvel Heroes' Flick"). » Steven Spielberg revealed live via satellite that Karen Allen would return in the forthcoming fourth "Indiana Jones" as the whip-wielder's greatest love, Marion Ravenwood (see "Comic-Con: Karen Allen To Appear In 'Indiana Jones IV' "). » "300" director Zack Snyder revealed the poster and cast for his highly anticipated "Watchmen" movie (see "Comic-Con: 'Watchmen' Poster Revealed!"). » Sam Raimi let it slip that he recently met with Marvel producer Avi Arad to lay the groundwork for a "Spider-Man 4" script. » The villainous Zachary Quinto was announced as Mr. Spock in the upcoming "Star Trek" re-launch flick (see "'Star Trek' Earmarks A 'Hero' To Play New Spock In J.J. Abrams Flick"). – Seth Rogen told us his “Green Hornet” isn’t going to be all laughs. – The Marvel panel blew our minds with “Incredible Hulk” news and “Iron Man” footage. – Hope you aren’t feeling Narnia’d out because a lot more flicks are on the way. – We spent a day with the man of the moment, “Watchmen” director Zack Snyder. – We found a pretty creepy dossier on “The Dark Knight”’s Joker. – We took a look at J.J. Abram’s secret monster movie and its guerilla marketing. – We found out that the only thing better than one Spock is two Spocks! Those who visited www.ExtremeHalloween.com were asked to take the Halloween costume survey where they were asked several questions. This also entered them into a weekly drawing for prizes. The information from the years past and the costume survey helps determine what costumes join the top 10 list. Where can you get these top Halloween costumes? Just visit www.anniescostumes.com. Here are some great Halloween Makeup Tricks of the Trade. Never use makeup or baby powder around sources of open flame. Only use approved makeup for facial areas. Do not mix different kinds of makeup. First begin with a clean face. Most FX artists recommend a good astringent to remove facial oils followed by a cold water rinse to close the pores. An extremely thin coat of vaseline at this point will aid in makeup removal. Find a place in front of a mirror with a good light source. A good comfortable chair would help. Ensure there are no sources of flame near the makeup. Decide if there will be any prosthetic pieces such as scabs, scars or areas where the face will be built up. I like to apply them first, as the spirit gum adheres better to a clean face. Start with any of the prosthetic devices you want to add: scars, warts, nose etc. Where the device will go, apply spirit gum to both the face and the device. Allow the spirit gum to get tacky before applying the device. If using latex, apply a base coat of latex and gradually build the area. For scars, apply a thin layer of latex then cover with a single piece of tissue, repeat the process until the scar is formed. When you're satisfied with the build-up or prosthetics, apply a foundation makeup. The color will depend on the required outcome, white for vampires, gray for corpses, red for devils, green for witches and goblins, blue for a frozen look. The foundation should be applied lightly rubbing on face then patting to blend the makeup. With the foundation applied it's time to highlight and shadow. A makeup brush will assist in even coating. The final step in any makeup design is to set the makeup. For any who has tried to wear makeup while acting in a haunted house or going to a party can tell you, unset makeup while run with sweat ruining the makeup in a matter of minutes. The key is to set the makeup. There are many commercial products but nothing is cheaper and works as well as baby powder. A simple dusting of baby powder while keep the makeup fresh and set throughout the night. Baby powder is also especially useful for creating the look of age in zombies. A good powdering of the hair and clothing provides instant aging. For scary, gorey, glamorous, or just different makeup kits, visit anniescostumes.com. I saw this fun post and picture on a vintage blog called Found in My Mother's Basement. 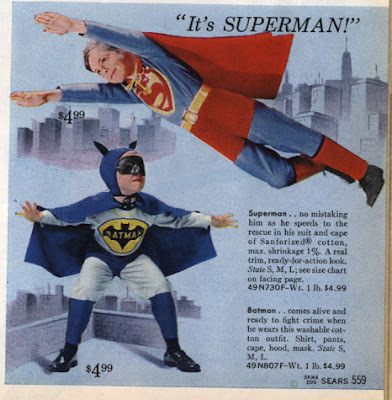 Costumes have come a long way since 1965! This is from the 1965 Sears Catalog. Photographs may be just bits of paper prints but it has potent effects to your memory. With pictures, our memory runs wild. It makes you recall, let alone reminisce the time that the photo was taken. Then you will find yourself smiling if not laughing at the thought of it. Thus, photographs bring memories, fresh and crisp to our minds. In addition, photos are sort of like an evidence that we were once such and so. With pictures taken, you can show it to someone just to prove that you were at some concert or that you were once dressed as a die at one Halloween party. Hence, if you love dressing up during Halloween, you'd better take hold of these tips so you can take high-quality pictures. You'd never really want to miss out the fun in the pictures, do you? First, take your camera. Use the kind that you know how and is comfortable at operating. It doesn't matter if it's high-tech or not because even disposable cameras could shoot good pictures. Just as long as you know how the camera functions, it'll do. Second, look at the people you're going to take pictures of. Examine each of them and the point that draws attention in them. It could be their faces, their masks or their outfits. Take into account the source of light, too. If you want to give pictures a scary feeling, you can let your subjects use a flashlight right down under their chins. Third, if there are a number of them, make sure to let them stand close to each other. Never place them in one line. If possible, have them in a number of rows. You can let others stand while others kneel in front. If your subjects are children, make sure to get that picture within their level. This means you would have to go on your knees if needed. That will give you good results. You may also take candid pictures. Just always be poised for action. Fourth, let your subjects stay calm and comfortable. It would be more fun to have them let a sound of the personalities they're dressed up for. If someone's dressed as a tiger, make him or her growl. This would bring out laughs in everyone not just kids but grown-ups, too. Fifth, click the camera and get the picture! However, if you wish to take photos of Jack O' Lanterns, make sure to do it at stark dark. As much as possible, the background should contrast the bright, translucent appearance of the lantern. The original bare bones DVD of Flash Gordon (released almost a decade ago) has long been out of print and commanding high prices on eBay; those days are pretty much over now, with the arrival of this spanking-new “Saviour of the Universe” edition (and no, that’s not a typo; for some reason, they’re using the British spelling of “Saviour”), although, except in terms of image quality, this isn’t much of an upgrade. But that image quality is a biggie. The box (which has a hinged, flip-open lid, like a Star Trek communicator) touts the usual “digitally remastered” image, and it really does look spectacular, every vibrant color pulsing with life. Screenwriter Lorenzo Semple, Jr. also speaks out in a short interview segment, which is the highlight of the disc due to Semple’s brutal honesty and straight talk about his role in the film and the finished product. The inclusion of the first chapter of the original 1936 Flash Gordon serial with Buster Crabbe seems appropriate, and demonstrates that the 1980 version really wasn’t all that outrageous in what it was recreating. A trailer for the new Sci-Fi Channel Flash Gordon series is literally twelve seconds long, and features only a title graphic, with no clips from the show. And that’s it. No commentary tracks, and no nuts-and-bolts material. Where are the deleted scenes and “making of” doc seen on the UK “Silver Anniversary” edition? This is definitely a missed opportunity, though it’s tough to quibble with the overall presentation of the film. If you were one of those who was cranky about Flash Gordon in the old days, give this disc a spin and see if your opinion doesn’t change. If you loved it then, this is a great keepsake, especially if you missed the first edition. And if you’ve never seen it, prepare yourself for a goofy, candy-colored, funky-retro treat. Flash Gordon is a unique confection, and one of the most enjoyable SF films of the '80s. Get into the 'Flash' spirit! Check out the cool superhero costumes from AnniesCostumes.com. The horrifying return of Michael Myers through the eyes of Rob Zombie! The movie will be released on August 31, 2007. You might have seen the previews already and this remake looks even scarier than the original. Granted, the original movie is a classic and was quite scary enough, especially since I was pretty young when I first saw it. The voice over on the Halloween trailer says, "This August, Rob Zombie unleashes an extreme vision of terror and reinvents a legend." Some critics, although fans of Rob Zombie, are asking why? Why remake a classic? I personally think the trailer is spooky as is and has intrigued me enough to want to see the movie. Although, I am a movie fan, contrary to what you might imagine, I am not a huge horror movie fan. I guess growing up in the Halloween business has somewhat desensitized me to some things, and at the same time, some recent movies are just too sick or gory for my taste. I guess I live in a world of costumes, makeup and horror, so I like something different in most of my movies. But I will go and see this new Halloween movie, I'm kind of excited about it, actually. The new Halloween movie trailer, I feel, is actually too scary to post here on my blog, since I want to keep my blog PG and family oriented about things related to Halloween and Halloween costumes. I almost forgot . . . for any of you avid fans out there, http://www.anniescostumes.com/ carries the official Michael Myers Mask as well as the Michael Myers costume for adults. If you get it now, you can wear it to the premier and at Halloween so that you can get double the fright time out of it! According to an article on August film openings, the amnesiac assassin Jason Bourne is back, and this time he clobbered Homer Simpson on his way to scoring the biggest film opening ever for the month of August. "The Bourne Ultimatum," the third movie in the espionage action series starring Matt Damon as a one-time CIA hit man searching for his past, grossed $70.2 million its first weekend to rank as North America's top film at the box office, according to studio estimates on Sunday. That tally, fueling an unusual late-summer rally at the multiplex, far exceeded the debut ticket sales generated by the first two films in the Universal Pictures franchise. By comparison, "The Bourne Identity" opened at No. 2 with $27.1 million in June 2002, and the "The Bourne Supremacy" landed at No. 1 in July 2004 with $52.5 million. Those two films went on to gross nearly $485 million worldwide combined. The latest "Bourne" total marks the biggest first weekend ever for a movie in August, surpassing the $67.4 million opening posted by "Rush Hour 2" the same weekend in 2001. Exit polls showed the movie played to a slightly older crowd than much of the summer's high-profile popcorn fare, with 57 percent of its audience over the age of 30. "Bourne's" robust debut continued what has been a very healthy summer for Hollywood, with domestic box office receipts since May 1 up nearly 6 percent compared with the same period last year. This weekend's cumulative gross for all films is up about 25 percent year on year. "It's a very crowded and unusually competitive August marketplace," said Paul Dergarabedian, head of box office tracking service Media By Numbers. "August has traditionally been a cool-off month for summer. ... What's unusual this summer is that studios have put some of their biggest films at the end of July and early August." Last week's domestic box office champion, "The Simpsons Movie," a feature-length version of the long-running TV cartoon, slipped to second place in its second weekend with $25.6 million in U.S. and Canadian ticket sales. Despite its 65 percent drop-off from week to week, "The Simpsons," from News Corp.'s 20th Century Fox, has now racked up about $128.6 million domestically and $315.5 million worldwide. For Simpsons Halloween Masks, visit www.anniescostumes.com/simpson.htm. If you are military stationed overseas, make sure to order your Halloween costumes as early as possible. For the month of August, we are having an APO and FPO special. You can receive free shipping (select ground shipping) and enter the coupon code APOFPO in the coupon field. Coupon Rules: Cannot be combined with any other offer, minimum order to use coupon $50.00. We ship our your order within 2 business days via USPS priority mail, however, we have no control over how long it takes for the military to forward on the packages to you, so allow 15 days for delivery. If you have any info for us on estimated delivery times to APO and FPO addresses, please let us know! Mark your calendars for Comic Con International in San Diego next July 24 - 27 2008! August 4th - 13th is Florida's Tax Holiday. Some costumes and costume accessories are included in the list of tax free items, so this is a great chance to purchase your costumes early and receive a 6% discount. Attention Florida Residents: August 4th through August 13th is the State Tax Holiday. No tax we be collected on sales of clothing, footwear, and certain accessories sells for $50.00 or less. All eligible orders will be refunded the sales tax after the order has been placed. Please feel free to contact our customer service department with any questions: 1-877-413-8747 or email us: costumes[at]anniescostumes[dot]com. Over at WhySoSerious.com, the Joker seems to up to his usual tricks, posting cool clues about the upcoming Batman flick. Our friends at Warner Bros. claim they have nothing to do with the site, but clearly powerful forces are at work here, reports MTV's moviesblog. The Dark Knight movie, the sequel to Batman Begins with Christian Bale, who does an awesome job in the role of Batman and Bruce Wayne. Michael Keaton was my favorite Batman, but I really love Christian Bale and Batman Begins is definitely my favorite Batman movie. Although the original with Adam West and the "Bat Shark Repellent" is surely a classic. I guess today's joke over at whysoserious.com is an auto redirect to http://www.rent-a-clown.com/. And here is a link to The New Dark Knight Teaser Trailer! In case you can't tell, I am a huge Batman fan, I even watch the Batman cartoons on TV. Have you seen them? They are pretty cool! It airs on both the WBKids and Cartoon Network. Batman also appears in the Justice League cartoon and in the Justice League Unlimited cartoon. Either the writer, director or producer of the Justice League cartoons must be a big Batman fan. His character there is awesome - just how you would picture Batman to be. DC should really get together and plan out a live action Justice League movie - they already have a Batman and a Superman, a WonderWoman movie has been in negotiations for way too long and Superhero action flicks do so well - why not? Follow in marvel's foot steps with Hulk, Iron Man, and Thor Movies all leading up to a live action Avengers movie with the same actors. That will be cool! Can't wait to see them all. So stay tuned for more Batman inside info: Same Bat Time & Same Bat Channel!